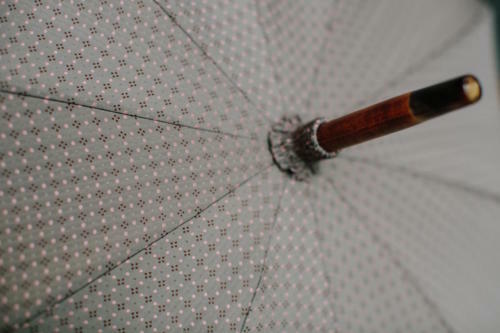 “The opening of the umbrella should sound like a car door,” said Michel Heurtault, looking me meaningfully in the eye. I didn’t get the connection immediately, but he slowly pushed the umbrella open, and as it locked open there was a satisfying ‘thunk’ of metal sinking into wood. The resemblance was marked, and very satisfying. Umbrellas are potentially beautiful accessories. The range of woods that can be used in the shafts is very broad, even today when so few ‘coppiced’ woods are kept for the purpose. The canopies can be made of any cotton, polyester or silk – with the latter having the most potential. And precious materials are often used in the handles and ends, with buffalo horn being the most common but also gold and silver used. But men rarely get any of this. Men’s umbrellas are nearly always black, with a dark wood or metal shaft, and a fairly non-descript handle. 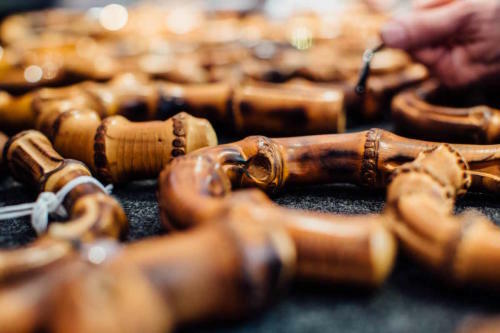 Only a handful of European makers go any further and make single-stick pieces (where the shaft and handle are one piece of wood) or use unusual materials. 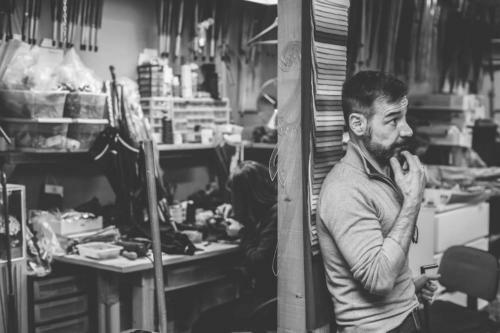 We’ve covered most of those makers on Permanent Style before, the most notable being Mario Talarico in Naples and Francesco Maglia in Milan. The UK has James Smith & Sons and Fox, though neither have quite the artisan detail of the Italian makers. Michel Heurtault, however, takes things to a whole new level. The Paris-based umbrella maker has only been in business for seven years, having come from a background of restoration and film work. But he brings a fine, couture level of work to even everyday umbrellas. For 20 years, Michel worked with restoring old costumes, outfits and corsets for period dramas – including a stint in 1996 making haute couture for John Galliano at Dior. Then in 2008 he decided to set out on his own, bringing that vintage and couture experience to new creations. So what does he do that’s different? Well, he doesn’t bend and manipulate his own woods, which is one highlight of work at Talarico or Maglia. These are all bought in. But the work he does with the finishing, canopy and sewing is exceptional. Each piece of the canopy (always silks, never synthetic) is cut by hand so that the patterns match perfectly – like the shoulders on a shirt. 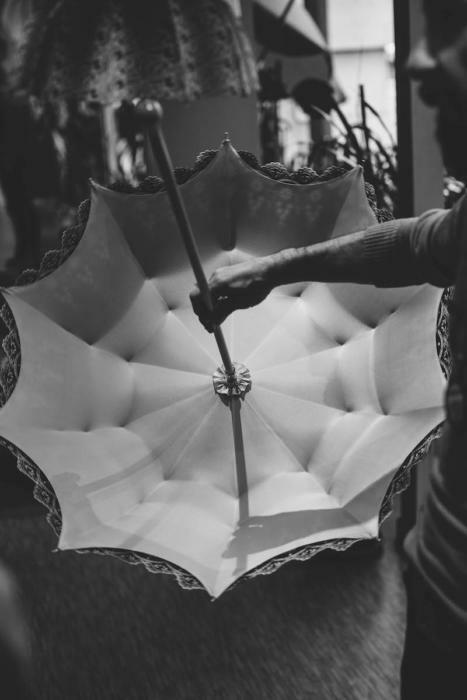 The circle of silk that sits inside the canopy, against the shaft, is cut with serrated scissors into a ring of points – creating a flower-like piece of silk origami. 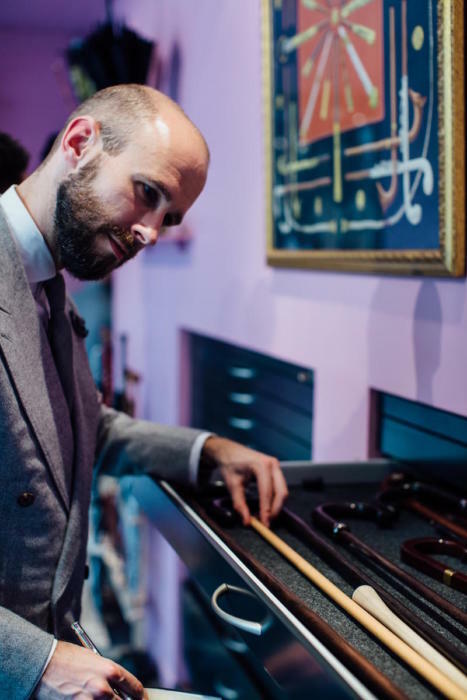 In common with other top-end makers, Michel usually uses horn to tip the umbrellas. But he also inserts it in other places, such in the curve of the handle (see image below). This is typical of his luxurious and inventive approach to design – one which also involves precious metals and skins. He recently incorporated a jade handle made by Fabergé for a female client. Most of Michel’s work is for women or costume, and it is these elaborate pieces that really show off his abilities – such as in the lace or hand-embroidered canopies, some of which are pictured here. But his men’s pieces rarely seem effeminate. With a dark silk canopy, the little touches described above become very subtle. 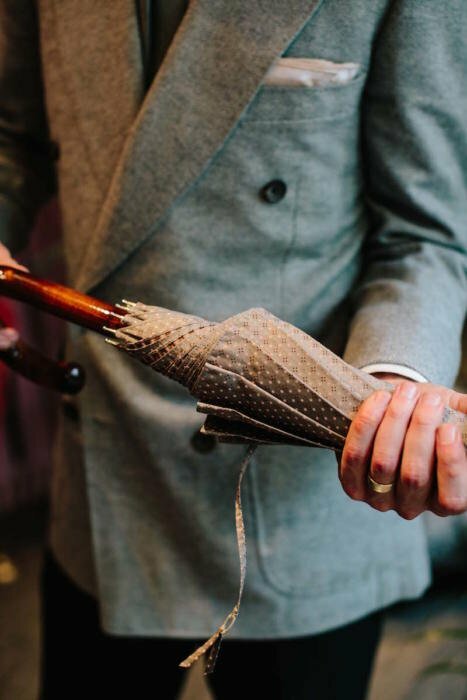 And many silks, like the grey-and-silk one pictured on the umbrella I’m holding, come from tiemakers, so are quite formal and geometric in their patterns. There are many other craft points. The canopies usually have a slight wave to them, curving up as they leave the shaft and then running down towards the edge. Linings to the umbrellasAnd there’s the way the mechanism is lined up with the shaft, creating that car-like clunk we opened with. 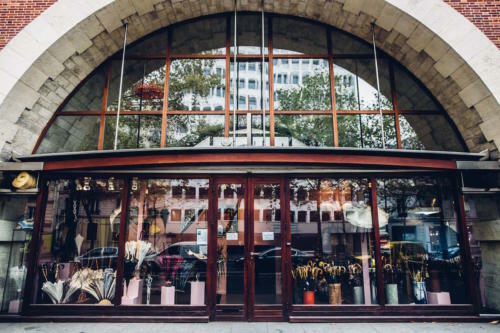 Michel (above) is reopening his shop in Paris’s 12th arrondissement – under an archway – in January. It’s a nice space, with the back half a workshop for him and his apprentice Andrea. He points out that handing down his skills is an explicit requirement of the Master of Arts award he holds from the French government – it requires ‘mission et remission’. 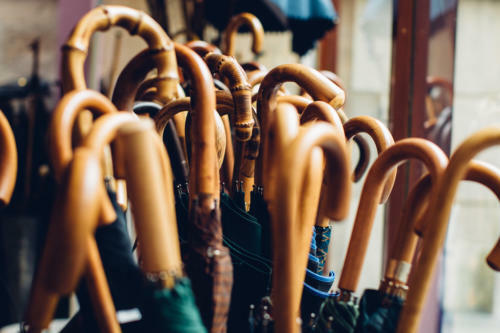 Most of Michel’s work is made to order, but there are always a handful of men’s and women’s umbrellas lying around to either buy or be inspired by. Most men’s models are around €490 and take anything from 3 days to 3 weeks to make, depending on the materials. Those involving precious woods are usually between €1000 and €2000. This is, of course, extremely expensive for an umbrella. But it feels good to know there is a top-end to the spectrum of makers, from Fox through Maglia to Heurtault. 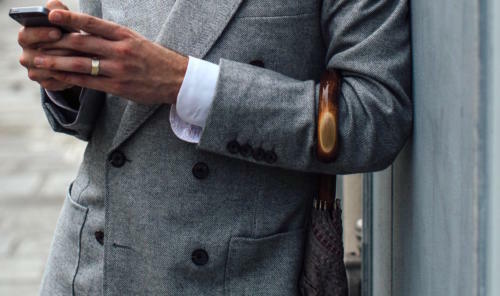 And the level of work is a suitable accompaniment for a Camps de Luca suit or an Hermes briefcase. You can follow the discussion on Heurtault umbrellas, Paris by entering your email address in the box below. You will then receive an email every time a new comment is added. These will also contain a link to a page where you can stop the alerts, and remove all of your related data from the site. Fascinating post, as usual. This may seem like a foolish question, but is silk the best material for repelling water? Does it have to be treated with something? I notice your shirt cuffs are unbuttoned in the fifth picture. Is this for style reasons? What jacket are you wearing Simon? Does that mean that your coat sleeves are also too short, as they appear to be the right relative size? Any thoughts on Brigg as an umbrella maker? Following your article on Smith, I went down there.. Unfortunately, I don’t know if it’s because it’s near to Christmas, but I found the staff very rude. They kept insisting they couldn’t have it done by Christmas, which I kept saying didn’t bother me.. And they were saying they couldn’t put a gold tone collar, couldn’t change things, etc. Even though I kept stressing, I understood and wanted to order a custom one. Irritating. Brigg was much more accommodating, and –instead — I ordered from them. But I haven’t read anything about Brigg umbrellas, and can’t find many articles. First of all–Merry Xmas and Happy Boxer Day!! I hope you and yours have a delightful holiday. Your comments about Michel and his products is most interesting. The French craftsmanship is supreme, particularly for the femmes in our lives. However, there are great pleasures with entities such as Charvet and Mes Chaussettes. You have now added to that. My only question deals with ordering their umbrellas. Can one purchase any of their products by means other than visiting them in Paris? One way or another, I shall make a point of connecting with them. Thank you again. A good umbrella is such an underrated and important accessory. Nothing else can provide the same level of smugness and superiority as whipping out your bespoke shaft during a downpour. Particularly when all around you are drowning. That said, the correct colour is crucial and it would be good if you could devote a piece to town and country options ? Also, probably an enigma but do any of these makers do anything interesting that folds ? 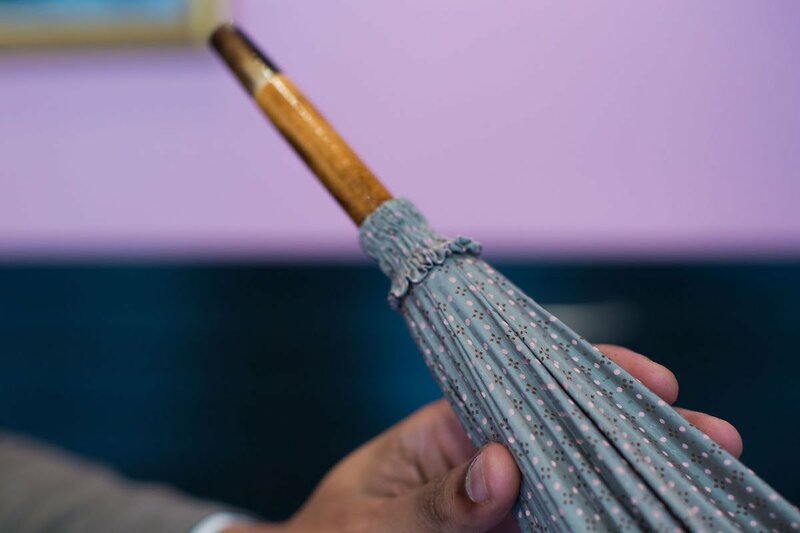 This is interesting – a folding bespoke umbrella. Have you any idea of costs? Perhaps this could make for a great PS collaboration with orders being placed up front? Isn’t a bespoke-edition an oxymoron? Serge Amoruso, for fine bespoke leather goods. One last observation re umbrellas. Have you visited Swaine Adeney Brigg? I have used their umbrellas for years and, when necessary, they have very kindly repaired them. The car door thing is so true, I love the noise my James Smith ‘brolly makes. I don’t mind metal ones either, you can pack them slimmer which I think I prefer to the fuller wooden ones.